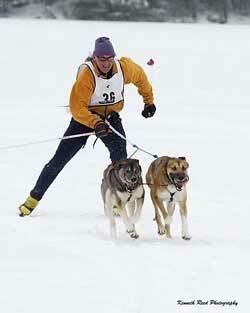 Skijoring is the fast and thrilling sport that combines cross-country skiing with sled dog mushing. You and your dog will love this exciting sport. We have the perfect setting to try skijoring with groomed trails, equipment and lessons. Take a lesson from two-time National Skijor champion Jim Blair, owner and operator of Eden Mountain Lodge Vacation Rentals and Dogsledding Tours. Skijoring is not for beginner skiers. We do not offer single lessons with our own dogs. We cannot guarantee that all pets will turn into great sled dogs but we're ready to give it a try with any breed. Jim has discovered that the most effective way for you and your dog to grasp the sport is through a multi-day lesson package. The first day he will hitch your dog up with his own team for a crash course in pulling, after which you and your dog will hit the trail. In subsequent lessons he will help to hone your skijoring skills. Training a dog to skijor generally takes more than a few hours. But we can show you the ropes and give you enough guidance to work with your dog on this fun and thrilling sport. Please call 866-635-9070 or email for more information. Skijor lessons are not available during holidays and race events and are offered midweek only.